Wolf Gunworks owner is Frederick A. Wolf. He dedicates his life's work to creating the finest hand tuned and crafted firearms available today. Fred started shooting and hunting when he was very young, traditions passed down for generations in his family. Until 1994 he was an auto machinist and technician but was forced into a new trade by a bad knee injury. He started his gunsmithing career in 1994 and after a two year apprenticeship, Fred started his gunworks business in New England. In 1999 Fred moved to Port Charlotte and started Wolf Gunworks. 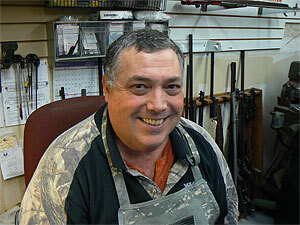 Fred has repaired,restored, customized,modified,evaluated,appraised, and sold thousands of guns for the past 20 years. Fred's mission is to produce the finest hand crafted firearms in his shop that are tuned to perfection. 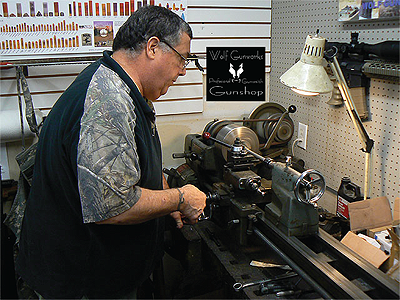 Wolf Gunworks is located inside J&J One Stop Gun Shop And Indoor Range. Wolf Gunworks uses state of the art equipment and uses modern techniques to produce the finest hand crafted firearms available anywhere. We are dedicated to a quick turn around of your precious firearm. In most cases you can expect your rifle or pistol back within two weeks. Perfection is our goal, and while "perfection" in all things may not be attainable, we come pretty close.